The reaction totally lived up to the prank. A hole in one. The shot of a life-time. Or at least a life-time’s work crafting the swing. Countless shots that trickle toward but never down into the cup. One can only hope to be so lucky. To do it among your closest friends, too? The stuff of dreams. The Oklahoma Sooners men’s golf team took a golf prank to a new level this week against innocent freshman Vincent Welch. 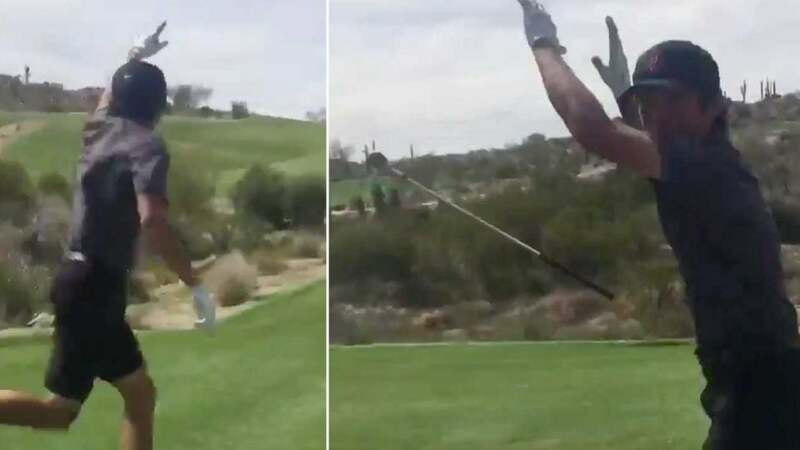 The young man was teeing up last among the group on an uphill par-3 at Scottsdale National’s Bad Little Nine, where only the top part of the flag was visible. Thankfully, if there was an ace, a teammate around the green would acknowledge the result. Unless there wasn’t an ace…and they were all out to trick you the entire time. The latter is exactly what happened. Welch hit a great shot that flew beyond the hole and spun back toward the cup, but looked plenty good from the tee. A simple reaction beyond the green made it seem that, yep, he had aced it. Sadly, he had not, and the ensuing reaction of pure elation made it all the more painful. Check out the tee box view here. What a reaction. Club toss. Leap in the air. Sprint toward the hole. Everything you’d expect. Now check out the true result. So close! This appears to be some sort of sick tradition played by the OU team. It’s definitely not their first faux ace. At least now that it’s hit social media, future freshmen should have an idea that something like this is coming for them, too. Will they recognize it, though?